Storage units are often home to unexpected treasures! Just look at all the TV shows dedicated to these unique finds. 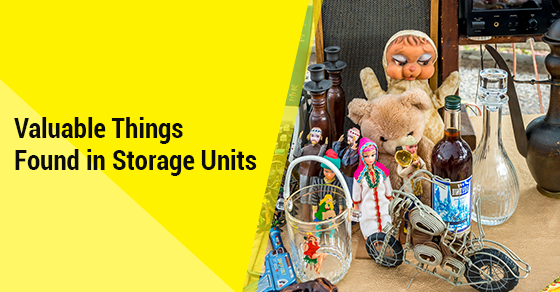 After a storage locker has been abandoned for a certain amount of time, the units are often auctioned off. In some unique stories, the winners get a whole lot more than they could have dreamed of! The thrill of finding storage unit treasure often comes from the element of surprise. Sometimes things that look plain on the outside, for instance, a stack of old newspapers, can be worth tens of thousands of dollars. On the other hand, a beat up car could be worth a million. There are many strange and obscure storage locker finds out there, but here are a few to keep an eye out for. Incredible storage unit finds have included lost art and sketches by famous artists. The masterpieces may hang in museums, but it took hundreds of sketches and other pieces to get there, and finding those sketches and lost pieces in storage units can yield huge rewards. Clothes and jewelry can be worth lots of money, especially if the clothes include furs, or designer pieces. Since fashions change, clothes that were once in style may be locked away for years. Keep an eye out for designer labels, real fur, and high-quality jewelry. At first glance, old comic books and figurines may not seem worth much. However, collectibles and memorabilia increase in value as time passes, and depending on the issue or year of the make, it can be worth millions. There are many experts on comic books and collectibles who can appraise these items for you. When the contents of Burt Reynolds’ storage locker went up for auction, a group came together to buy most of the items, which included Roy Rogers’ saddle, many personal letters from other celebrities, Reynolds’ honorary sheriff badges, and many other movie-related and personal items. Not only are these finds worth lots of money, they’re full of nostalgic and cultural value. Antiques are always good finds, as the items are usually good quality and easily re-saleable. The older the antique, or the more cultural and historical significance it has, the more the value! Real life can be stranger than fiction! On one occasion, a chest full of gold and silver coins and bars was found in a storage unit, so heavy it reportedly took three men to carry it out. Finding valuable treasures may seem like a rare chance, but once you start looking, there are many stories of amazing (and lucrative) finds out there!